it looks like they would fall into the Umbrella Net category. Assuming that, can they be used like a crab trap with a legal buoy attached rather than attached to a dock? The reason I ask is it would be very convenient to set out say 6 of them to be checked occasionally while fishing an area. Since conventional crab traps are so big and bulky I'm not inclined to mess with them, but these 2-ring nets don't take much room on the boat and can be effective. Unfortunately, the regs aren't clear if it's legal method when used with a buoy or not. That's an interesting question. That net doesn't really match the description of an umbrella net in the regs. I think I would call and ask a game warden to be sure. Agreed it's not exactly as described by the umbrella net description, but it's the closest. If it's not an umbrella net, then it's not a legal device and yet you see them sold and used all the time. I did contact TPWD headquarters and got a generic response saying if it's not on the legal devices page it's not legal. Makes no sense considering how common they are. I guess contacting the local GW is the best bet unless someone has some insight. 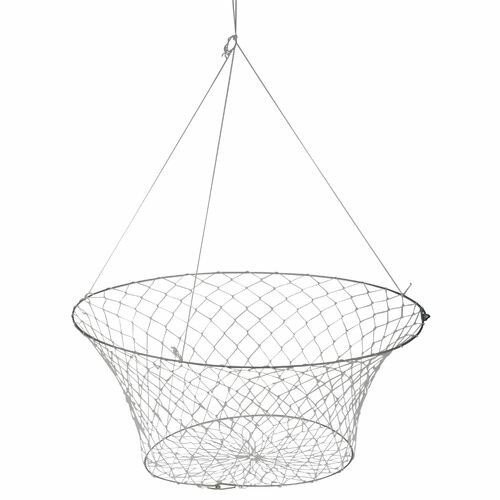 A non-metallic mesh net that is suspended horizontally in the water by multiple lines attached to a rigid frame. May not have within the frame an area that exceeds 16 square feet. OK, let's assume they're a legal umbrella net which seems reasonable. Can you attach a legal buoy to them as though they were a conventional crab trap as described in the regs? No doubt they are legal. They have been around forever. It just depends on how you interpret the description. One man's meaning might not be the same to someone else. The original question was how can it be used. it doesn't say that you have to tie it to a dock/pier or hold it by hand, etc. i doubt any Game Warden would make a big deal about it. "Another common way to fish for crabs by hand is to use a crab net, which is termed an umbrella net by TPWD. It features two rings attached by mesh with the larger top hoop attached to a pull line, and when baited and dropped to the bottom, the device folds flat." I suspect you are totally correct about that.